Diagram H. Player pounds 2 balls 10-15 times. Attacks elbow and cuts to basket. Tucks one ball under arm and finishes with the other. Diagram I. 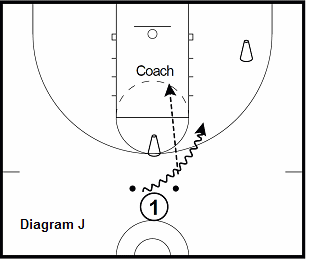 Player makes continuous one dribble change of direction. 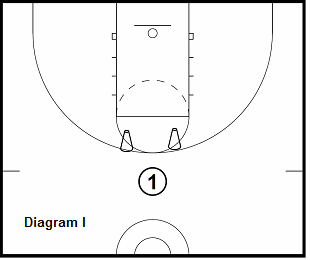 After each move player touches opposite cone with guard hand. 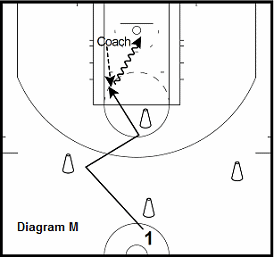 On the cue of the coach the players explodes into la yup or jump shot. Focus: Creating the habit of bringing through the guard hand after each change of direction. Diagram J. Player pounds ball 15 times then passes off the dribble with the hand called by the coach. 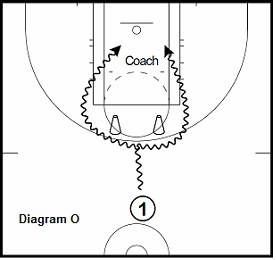 Then changes direction into one dribble jump shot. 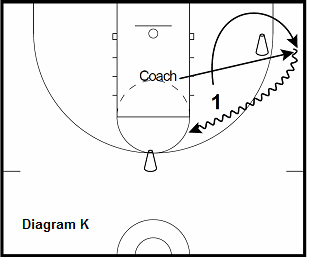 Diagram K. Player flashes behind cone in the corner for pass from coach. Player goes into pick and roll and makes jump shot from elbow. 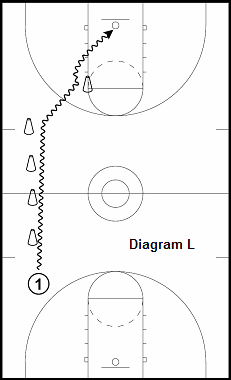 Diagram L. Player weaves between cones with various moves working on hand speed with each move. Player then looks to duplicate speed of move on cone at the elbow. 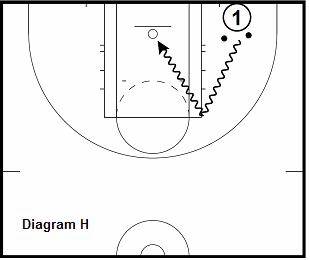 Emphasis: Being efficient between pound dribble and move, and between move and pound dribble after. Diagram M. Player moves through cones working on speed and agility. Coach throws out ball for player to explode to. Player then scores on coach while taking contact with a blocking pad. 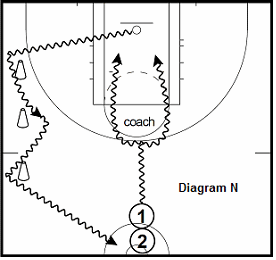 Diagram N. Player attacks coach with change of direction move and scores. Takes ball out of net and performs change of direction moves through cones. 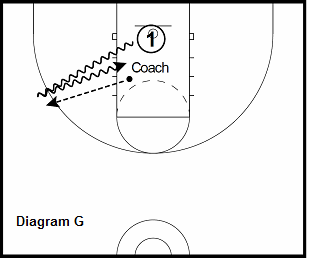 Coach gives resistance to player on move to simulate game contact. Diagram O. 1 1/2 minutes on clock (forces player to continually attack). Set goal of how many makes before time runs out. Make player make move on way out to start drill over. 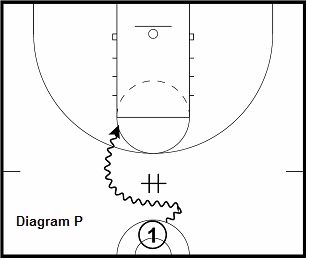 Diagram P. Player uses chair into high pick and roll series.